Crispy toasted sourdough topped with smokey refried beans, zesty tomato & avocado salsa and a perfectly fried egg. An impressive but super easy breakfast, lunch or dinner that everyone will love! Vegan + GF option & healthy!! First make the refried beans. Heat the oil in a medium saucepan and add the garlic to fry until softened. Add the spices into the pan and fry for an extra minute or two until they release their fragrance. Then add the beans, water and salt, stir well and bring to a boil. Reduce the heat slightly and continue to cook for 8-10 minutes until most of the water has evaporated. Use a fork to mash the beans into chunky paste. Taste and add more salt if desired. Meanwhile make the salsa. Combine all the ingredients into a large bowl and stir well. Keep refrigerated until ready to serve. Heat the oil in a large frying pan. Carefully crack in the eggs and fry until the whites are opaque (you may need two frying pans here, or you could work in batches). While the eggs are frying, pop the bread in the toaster until golden brown. To assemble, divide the toast between the plates and spread over a few spoonfuls of refried beans. Add the egg to one side of the toast and the salsa to the other. Garnish with the remaining coriander, chilli flakes, lime wedge and serve immediately. If you are short on time, both the salsa and refried beans can be made up to two days in advance and stored in the fridge. When ready to serve reheat the beans slowly over the stove top or in the microwave. Gluten-Free: Use GF corn tortillas or another GF bread of your choice. Vegan: Omit the egg and replace with a little vegan feta or just have it on its own. Both options are delicious! Chipotle chilli powder makes the refried beans extra smoky. If you can't find it, you can also use regular chilli powder. 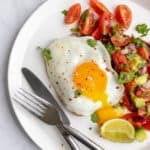 If you would prefer a slightly more authentic version of huveos rancheros you are welcome to use warmed corn tortillas rather than sourdough bread. This recipe also works well with rye bread or even a wholemeal bagel. If you can, try to use organic free range eggs. They are bigger and have a beautiful bright orange yolk.